Don't Feel Like Reading The Full Review? 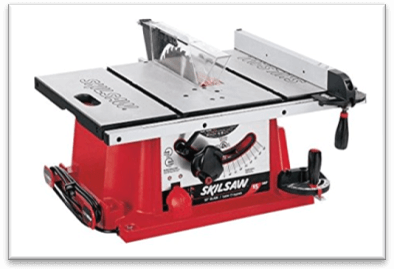 Here's A Summary Of The SKIL Table Saw Review. This SKIL table saw is a versatile saw with focus on helping to meet basic wood worker requirements. This portable saw has a lightweight foldable table with joint lock feature and an EZ view system with an automatically adjusting saw fence. Model 3410-02 is compatible with swapable dado blades and is backed up by an official 3 year warranty. This is a compact power tool which is capable of assisting you with basic level projects. Coming straight from the Bosch 4100 table saw to a SKIL table saw made me to expect the same level of performance, but things turned out a little different. I am certainly not brushing off the SKIL 3410-02 electric table saw in the wrong way; it’s just that there are a few weak links that could have been handled better. Needless to say, model 3410-02 is one of the coolest products that SKIL has released for a budget conscious consumer market. 3410-02 SKIL Table Saw Review – What Does This Power Tool Stand For? Closing Thoughts – To Buy or Not to Buy? I can sum it down to convenience, affordability and portability – that’s what the SKIL 3410-02 table saw is capable of delivering with a slight margin of error. Yes, you read that right; the miter gauge is not that impressive, which boldly highlights that “margin” that I was just referring to. It seems that SKIL somehow managed to outsource the 3410-02 table saw’s miter gauge product to amateur engineers. They did a score by messing up one of the key components that mattered in the end result. Since the gauge slightly misrepresents the readings, it makes it hard for homeowners to get by with precise cuts. 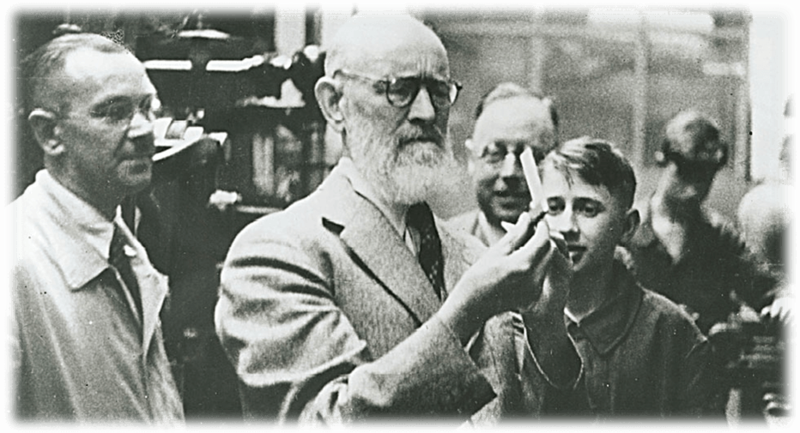 SKIL should have made sure that the readings on the miter gauge were accurate and crystal clear. But they’re not! Obviously precision doesn’t matter that much to those who mostly indulge in DIY projects. However, if you were a professional, my advice would be to hone your skills – so much so that you don’t have to entirely rely on SKIL 3410-02 table saw miter gauge for referencing. After all, with enough time and skill behind you, you will develop perception. It’ll help you to get through with more complex wood working projects with a relative ease and comfort. It’s Cheap! Going online for affordable table saws is easy. You can do that on your own, and that would eliminate the need to revisit the Powertoolbuzz website for fancy table saw reviews. However, we only try to recommend power tools that we’d use ourselves – and in that context, the options run a little thin for reliable products. Nothing reads more like C-H-E-A-P and trustworthy than SKIL, Makita 2705-10 and DeWalt DW745, but among these three, I am only recommending SKIL because of two particular reasons. This table saw comes with a foldable company supplied table. I know other companies that are offering the same thing, but foldability is usually not on the list. SKIL has ticked off unnecessary components from inclusion on this particular table saw model. There is no dust collection port on the 3410-02. Period. Now, some of you all may think that the absence of a built in “trash can” is bad news, but ask yourself: do I really need a saw dust collection chamber? Will it hinder my work progress, and is it totally necessary? All of this boils down to a simple lightweight table saw which only focuses on getting things done from point A to point B. i.e. if you are looking to make slab cuts, entry-level woodworking and DIY projects at home, SKIL has got all the bases covered. The overall build quality is impressive; SKIL used machine grade stainless steel for primary components. I am not sure about the fence quality, but it appears that it can withstand a bit of back to back thrashing easily. I tested simultaneous cuts that required the SKIL table saw fence to be pressed directly against the slab – it all went easy. This Skil table saw with its entire assembly weighs in at around 70 Lbs. You can carry it easily, which is why I’d call it a bench top saw to some extent. Had it not been for the portable four legged table, this model could have been classified as a table top power tool too. So, as far as long as portability is concerned, I am one satisfied customer. Dimensions wise, the coverage area is 30 x 13 x 21 inches. I exaggerated a bit by 1-inch length, but that doesn’t matter a lot. You are supposedly concerned with placing this product on a table, or a bench and leave it be for the rest of the entire seasons. The stock blade is kind of “meh”, but it works as advertised on basic level cuts. SKIL used a 28 toothed carbide tipped blade this time instead of going for a regular stainless steel blade. If you have been following up with our circular saw and table saw tool guide, you already know where this conversation is going. Carbide is actually good and very tough, but if it bends, it requires an expert to do repairs or replacements. Carbide does bend at one point, but as long as the blade is working fine, whether it’s a chainsaw, a circular saw or a table saw, you are in good hands. SKIL wanted to give the same effect, but they used carbide tips instead of an entire carbide build. Although the blade on the SKIL 3410-02 cuts fine, carbide tips cause it to churn out more noise. If you can bear with increased noise levels, then there shouldn’t be any issue. I’d also like to remind you that noise projection levels are a lot higher when you are confined in a closed space. Let’s say, you are working in a garage instead of an open place, then the SKIL 3410-02 table saw noise levels will be way beyond “bearable” limits. The good news is that this Skil table saw is compatible with dado blades… to some extent. You can replace the stock blade with an 8’’ Inch dado blade to make dado cuts. These cuts will vary in size, but the general consensus is positive as long as dado blade compatibility on a table saw is concerned. The Bosch 4100-9 table saw model that I reviewed earlier a few days ago, does not have dado blade swap feature. SKIL takes the lead in this context. For the record, I don’t know how the self aligning system on the SKIL 3410 model works. It is still a theory in test, but SKIL says that they made the table saw in such a way that the fence alignment is more of like an auto sense feature. It sounds like bull puzzle, but there are mixed reviews about the fence at the moment. The miter gauge is feisty; I already wrote about it in the above paragraphs. Maybe SKIL outsourced the production of the miter gauges to some other company because the work definitely shows lots of careless mistakes. Anyhow, I can only conclude the lack of quality to SKIL’s half assed effort. They substituted what could have been a good spare part with something that’s only expected from cheap quality table saws. This table saw is backed up by an official 3 year non extendable warranty. On top of that, the company’s reputation is well enough to trust them with any range of problems that you may or may not encounter during the product’s shelf life. This Skill table saw is a low maintenance unit, but should you run into any technical difficulties, SKIL officials are just a phone call away. This portable table saw comes with standard safety features. There’s nothing out of the ordinary as Skill is only offering an OSHA standardized riving knife for protection against kickbacks, a traditional plastic blade guard wit pivot control - and that’s about it. I’d strongly recommend that you use thick protection gloves and headgear for fully fledged fool proof safety measures. 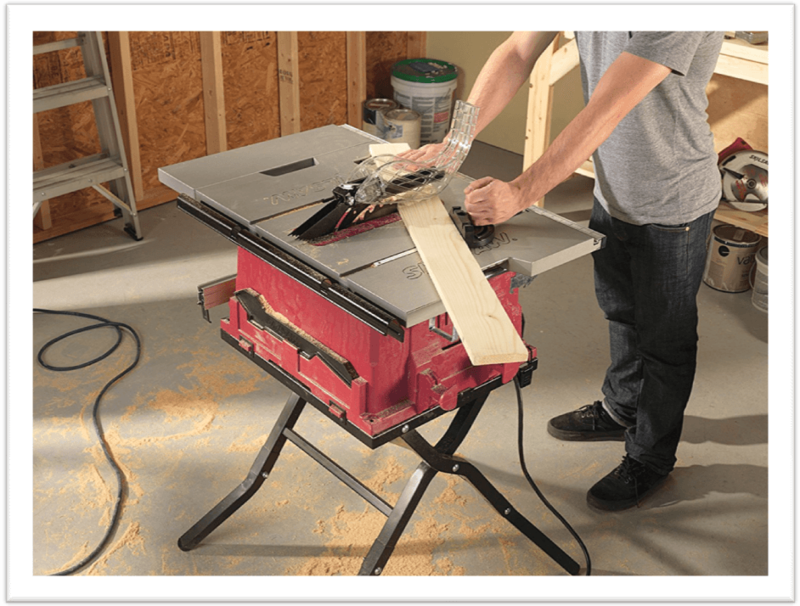 A versatile table saw with focus on helping to meet basic wood worker requirements. Ease of use due to EZ view system and automatically adjusting saw fence. Comes with lightweight foldable table with joint lock feature. You can adjust the table height and lock it in any desired position you like. 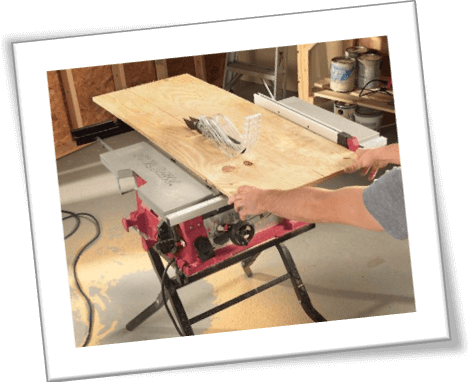 Cheap Price: The table saw is easily affordable by entry level users on a shoestring budget. Compatible with swappable dado blades. Backed up by official 3 year parts and replacement warranty. Not an ideal model for advanced users. Miter gauge is off mark. The numeric markings are either not easily visible on some units, or they are not precise. As a result, you need to be extra careful with measurements and precise cuts. Could be noisy due to carbide tooth blade tips. If affordability is your main concern, then SKIL is offering a very practical solution in form of model 3410-02 benchtop table saw. Since the blade diameter is 10 inches, you are basically singing up for a compact power tool which is capable of assisting you with basic level projects. For all I know, I could get away with tons of entry level carpentry designs and contracts easily – i.e. as long as I know my target audience and where to look for prospects. Worst case scenario: If you are not satisfied with this Skil table saw, you can call SKIL customer support and ask for an upgrade. They will offer you a replacement model with adjustments to billable amount. The rest is up to you. Good luck!